In the fall, Sidhart Krishnamurthi, grade 11, launched a fundraiser for The Khaled Hosseini Foundation, which raised more than $2,000 to help build a refugee shelter for a family living in Afghanistan. He shared his fundraising success story by writing an article that was published in the foundation’s newsletter and is still showing on the foundation’s blog. In the article, Krishnamurthi said that he got the idea to do the fundraiser in April 2012 after reading the novel “The Kite Runner” by author Khaled Hosseini. “The plight of the people in Afghanistan as described in the novel really touched me, and I wanted to somehow support the cause of rebuilding futures for families torn by war, poverty and unimaginable living conditions. This led me to the back cover, where I saw a link to The Khaled Hosseini Foundation website. On visiting the site, I got more information on various ongoing efforts to help the refugees,” wrote Krishnamurthi. He then explained that he set a fundraising goal of $2,000 – enough to build a shelter for a refugee family of six. With assistance from the foundation, he was able to make a plan to accomplish the mission through fundraising efforts at Harker. To attain his goal, he launched a “Family and Friends Campaign,” wherein he emailed various people (including members of the Harker community) about the foundation and urged them to donate a minimum of $25, which would help him achieve his goal. In turn, they received a signed copy of either “The Kite Runner” or “A Thousand Splendid Suns” (both by Hosseini) and a goodie-bag. This generated enough interest and money to build a shelter for a homeless family in Afghanistan. To help purchase the books, Krishnamurthi’s parents generously donated funds and he also raised money through a club called Interact, a youth rotary club. 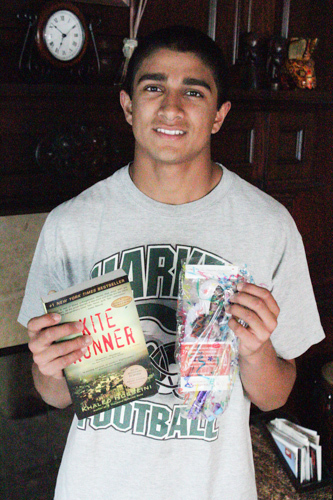 He assembled the goodie-bags with candy and bookmarks handmade by Afghan women in refugee camps in Pakistan (provided by the foundation). His book sales then attracted the attention of the administrators at Harker, facilitating a visit from Hosseini to speak about his books and the foundation. “Through this experience, I have learned that my life is privileged compared to most people in the world. It really changed me by helping and supporting families facing dire living situations. It also made me realize that people are genuinely kind-natured and willing to help others in difficult situations,” Krishnamurthi said.